In 2003 we organized Laughing Squid: NYC, our first big event outside of San Francisco, which took place at the now defunct CB’s 313 Gallery in the Lower East side of Manhattan. At every Laughing Squid show we always have the trio of Doggie Diner Dog Heads out front and of course we wanted to have them at our NYC show as well. So I had and idea, what if the Dog Heads traveled across the country just for the show? I called Laughing Squid partner and Doggie steward John Law. He thought it was a great idea and immediately started organizing a massive road trip. He invited a bunch of artists and cacophonists, as well as the Cyclecide Bike Rodeo including Jarico Reese and his bus, which lead the way to NYC, towing the Dog Heads along. John also invited his old friend filmmaker Flecher Fleudujon and together they documented the cross-country road trip, creating the 85 minute documentary “Head Trip”. John and Flecher are organizing a big event on Saturday, January 26th at Rythmix Cultural Works in Alameda, where they will be screening the film, along with performances by Mr. Lucky, Bishop Joey of the First Church of the Last Laugh, Loop!Station, Blake More, Phat Mandee, members of Cyclecide, Jon Sarriugarte and his Boiler Bar, plus Chicken John. Here’s more information about the film and the January 26th event. Also, check out the “Head Trip” tailer on YouTube. Just as the bombs started falling on Baghdad in early 2003, some of San Francisco most eccentric performers and whimsical characters (Bishop Joey/Ed Holmes, Steven Raspa, Blake More, Jarico Reese, etc.) 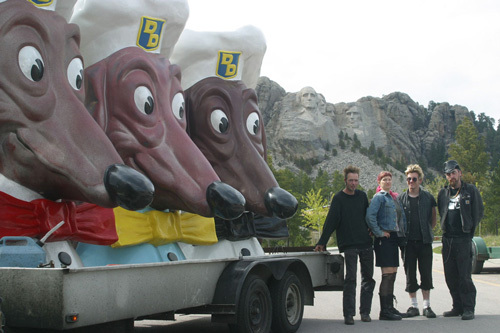 set out for New York City accompanied by three ten foot tall, three hundred pound fiberglas Dachshund Heads. Careening across America, the crew visits the Grand Canyon, Graceland, the Gateway Arch, Mt. Rushmore, the Washington Monument and many other celebrated roadside attractions along the way. Hauled in tow behind the SF Cyclecide Bike Rodeo’s 1966 Gillig Autobus, the Doggies encounter the spirit of America during a confusing period. Roadside encounters with citizens and rendezvous with eccentric artist comrades through out the “Middle” States are the heart of this journey.